Mix 2 1/2 cups flour and yeast in mixing bowl of stand mixer, using the paddle attachment, on low for about 30 seconds. Roll the chilled dough into a 10 x 20 inch rectangle. Spread the filling on half of the long side of the dough. Fold the dough in half covering the filling. Pat dough down firmly so the dough will stick together. Cut dough into three long strips. Press the tops of the strips together and braid the strips. Press the ends together at the bottom. Gently stretch the braid so that it measures 20 inches again. Shape it into a circle/oval and press the edges together. Transfer the ring to a parchment lined or greased baking sheet. Cover the dough with plastic wrap and let it rise until doubled, about 1 hour. While the dough is rising, preheat the oven to 350°. Bake the cake until it is golden brown, 20 – 35 minutes. Remove from oven and let cool 10 minutes on baking sheet and then place it on a cooling rack to cool completely before icing. To hide the baby in the cake, if desired, make a small slit in the bottom of the cake and put the miniature plastic baby in after the cake has cooled. This recipe uses Rapid Rise yeast which eliminates the time consuming first rise in a typical brioche recipe. Use a pizza cutter to easily cut dough into strips. The cake can also be made without braiding. Just roll up the dough jelly roll style after spreading the filling. 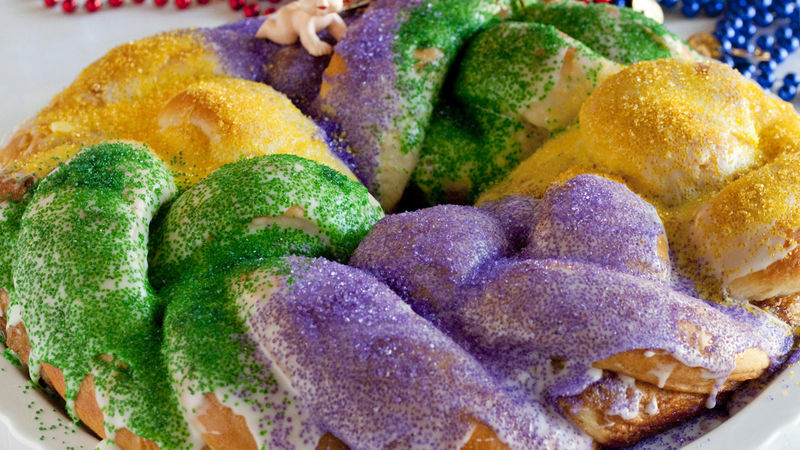 Mardi Gras conjures up images of fun, frivolity and feasting and no Mardi Gras celebration would be complete with a colorful King Cake. A brioche or sweet roll dough is braided, baked in a circle and decorated with icing and purple, green and gold sugars. Kind of like a crown shaped cinnamon roll all dressed up for a party.